ARRN published the “Reference Guideline for Restoration by Eco-Compatible Approach in River Basin ver.1” in March 2009. This guideline was written as an introductory handbook to the Technical Guideline for River Restoration in Asia which ARRN is going to establish, so that non-specialists could also understand the significance of river restoration and its approaches. We will continue to enhance the contents of the guideline mainly with the support of ARRN Technical Committee members. 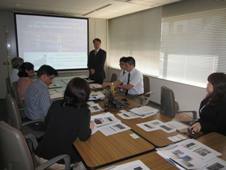 On Wednesday, May 20, 2009, the JRRN Secretariat was responsible for lectures (e.g. the improvement of river environments in Japan, case examples of restored river environments, etc.) 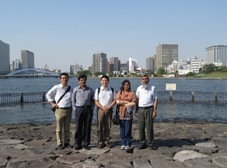 and guiding an site visit (the Sumida River) for people from the Pakistan government and local municipalities, who visited Japan for the JICA (Japan International Cooperation Agency) Training Program. 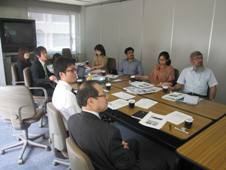 This group of trainees visited Japan to learn Flood Risk Management Practices. As they themselves have many issues in river environments such as waste dumping at rivers, we provided topics concerning river environments as essential considerations for river management and social enlightenment. There were questions and answers, and active opinion exchanges, both in indoor lectures in the morning and the technical site visit in the afternoon. This provided an opportunity for a meaningful interchange to both trainees and JRRN staff.